Caught up with some interesting tele at the weekend. 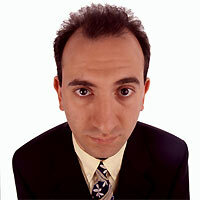 The South Bank Show had a slightly shallow look at Armando Iannucci’s career to date. As is typical with most SBS documentaries, 50% of the interviews were dedicated to Melvyn Bragg rather than the subject, so clearly there wasn’t much time to left for anything but a cursory glance at Iannucci’s radio career: Lionel Nimrod’s Inexplicable World and The Mary Whitehouse Experience got ignored, since presumably they weren’t highbrow enough for Melvyn, while his latest work, Armando Iannucci’s Charm Offensive, didn’t get a mention either – presumably because Melvyn wanted to dwell on chattering-class fave The Thick of It instead. Notably, Chris Morris didn’t get interviewed, although his notorious reclusiveness is almost certainly to blame for that. Yet their web project Smokehammer could still have been discussed even without Morris’s presence. A bit shallow, but good to see Iannucci getting some justly deserved recognition. In contrast to most shows, this season’s CSI had a shaky start but has scaled to new heights ever since. For once, a show that’s been worth sticking with. Amazing. Last Thursday’s CSI was just about the most downright disturbing thing I’ve seen since Requiem for a Dream. Still all a-quiver from it. Makes you realise just how shallow and dull CSI: Miami and CSI: NY are by comparison, and why William Petersen hates them so much as a result. If you’re in the UK, it won’t be on for a while, but when it arrives, you’ll know exactly which one I’m talking about. Smallville had a nice Chloe-oriented episode on Thursday, too. It wasn’t exactly Dostoevsky, but the slightly spooky ep had its moments. Allison Mack got to chew the scenery (and her nails) a lot, for once, while poor old Michael Rosenbaum got to stomp about and sound aggrieved – pretty much all he’s had to do this season. Why keep your best two actors on the sidelines? Don’t know. Best ask the producers. Nevertheless, the show does have one truly realistic theme, I’ve just realised: Clark’s obsession with Lana. Given a choice between Lana and Chloe, any right-thinking person would immediately go for Chloe (the one with the personality). Yet Clark goes for Lana? How can this be? Because he’s an alien, children. His emotions are alien to us and are unfathomable. And that’s the one realistic part of Smallville. Battlestar Galactica had a pretty stonking episode on Friday. A siege on Cloud 9 run by Dana Delaney, it didn’t quite work, but had enough standout moments and shocks to keep even the most jaded viewer in suspense. After a drawn-out start to the season, it too is starting to pull itself together. It still hasn’t quite hit the initial highs of the mini-series and the first subsequent episodes, but it’s definitely on the right track again. One worrying trend I’ve noticed though: Starbuck is starting to fall apart. Have you noticed how whenever a show builds a strong woman who’s better than all the men and is proud of this character, they still always end up making her a wreck, giving her dozens of vulnerabilities, etc? While it can be argued that much as Superman needed kryptonite to make him less than unstoppable, so any ‘perfect character’ needs flaws to make them interesting, Starbuck had plenty of flaws to start with. At the moment though, they’re drowning out her strengths. The reality of the character or a typical male reaction to a strong woman? Don’t know, although if you’ve been listening to the podcasts by exec producer Ronald D Moore, you might err towards the latter. I say this not because he comes across a misogynist – quite the opposite. Just that a certain cluelessness about female emotions seems to be the trend in some of the writing. Exhibit A: his original intention for Gina to kiss Baltar a few episodes back, after he showed her some kindness, even though she’s been gang-raped for months and was almost catatonic when he found her. I’m not claiming any special powers of empathy for myself, but even I know that’s not a happening thing. As a side note, it’s also good to hear that Lucy Lawless will be back, complete with her undyed blonde hair and natural New Zealand accent, as a regular in season three, since the show is starting to get a little cliquey and could do with some new blood. Plus she’s actually a pretty good actor when she doesn’t have tatty Xena plots to cope with. 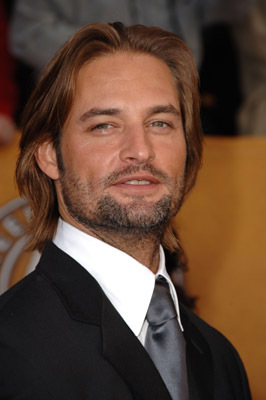 Lost had a strong Sawyer episode on Wednesday, explicitly designed to make you hate him again. Tis good, after all this cuddlification of him, to remind everyone how he started off on the island and what he did before he got on it. Tis equally good, after a spell of dull episodes, to have a strong episode again, since the show has been slightly adrift this season. While Adewale Akinnuoye-Agbaje who plays Mr Eko (or as IMDB would have it Mistereko) is a welcome addition to the cast, which is now gloriously swamped by English actors, the Ana-Lucia character (Michelle Rodriguez) isn’t, particularly since Rodriguez is playing the same role she always plays and most of the regular characters have been shunted to one side to make room for the new arrivals. Particularly noticeable by his absence is Sayid (Naveen Andrews), the coolest Indian-Iraqi the world has yet seen. We’re mid-season so a certain amount of looseness in the scripts is inevitable, but I’m hoping they pull it together again in the next few episodes. Stargate SG-1 continues. That’s probably all that needs to be said on the subject.